The people that make up the T&L Team are what makes our formula for success complete. We all work to satisfy our customers. 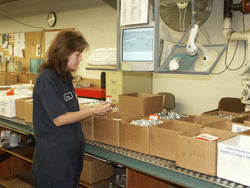 Lean Manufacturing, TQM and Lean Six Sigma tools are part of our operation. Our employees are trained and encouraged to use these tools to improve their job and their performance. One of the fundamental requirements of each employee and our training staff is to ensure we have our operators certified to perform their job. We also have a comprehensive cross training plan to ensure we have coverage in every part of the operation. We have a full-time training staff that works with our employees to train them as new employees and throughout their career here at T&L There are specific training programs for each of the functional job areas. We also have skilled trade apprentice programs and co-operative programs with our local high schools and colleges that allow us to continually update our skills and bring in new talent as we grow. Our people are challenged to continually improve themselves as well as their work processes. We expect at least one improvement documented and implemented each month. We also support our employees participation in ongoing education.